NEW YORK (CNNMoney) -- Maybe HP wants to rethink that whole "we're not getting rid of the PC" decision? As PC sales swooned, Hewlett-Packard said Wednesday that its profit fell by a dramatic 44% while sales sank 7% in its fiscal first quarter, ended Jan. 31. Rival Dell suffered a similar fate over the past three months, posting earnings and an outlook on Tuesday that disappointed Wall Street investors. Shares of HP (HPQ, Fortune 500) fell 2% after hours. Dell (DELL, Fortune 500), which had been surging this year, finished the day down 6%. HP said PC sales fell 15%, dragged down by slumping consumer demand. Consumer PC sales fell by a stunning 25% in the quarter. It was a miserable holiday season for basically every personal computer maker not named Apple (AAPL, Fortune 500), after holiday discounts and new ultra-thin laptops failed to win consumers over. Technology consultancy Gartner said U.S. PC shipments fell 6% last quarter from a year earlier, as tablets and smartphones continued to capture more interest (and shopping dollars). For the quarter, HP posted net income of $1.5 billion. The results included one-time charges totaling $300 million. 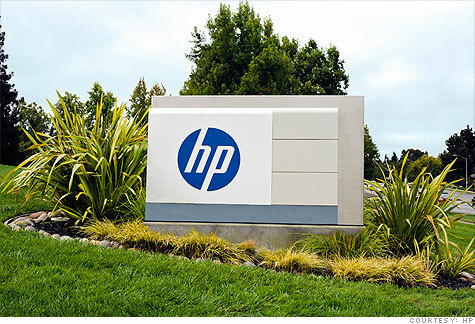 Without the one-time items, HP said it earned 92 cents per share. Analysts polled by Thomson Reuters, who typically exclude one-time items from their estimates, had forecast earnings of 87 cents per share. Though its first-quarter profit results were actually better than expected, HP's outlook disappointed. The company said it expected earnings per share of between 88 cents and 91 cents, far lower than the median 95-cent estimate forecasted by analysts. Sales at the Palo Alto, Calif.-based company were $30 billion, badly missing analysts' forecasts of $32.3 billion. "We are taking the necessary steps to improve execution, increase effectiveness and capitalize on emerging opportunities to reassert HP's technology leadership," Meg Whitman, HP's CEO, said in a prepared statement. One of Whitman's first decisions as CEO was to announced that HP would hang onto its PC division. In August, then-CEO Leo Apotheker said that the company would consider spinning or selling off its PC unit. That decision ultimately led to Apotheker's ouster and Meg Whitman's assumption of the chief executive role in September.